One of two new AZ releases both with one thing in common! 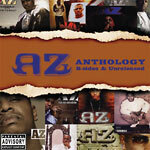 First up is Anthology: B-Sides and Unreleased featuring appearances by Nas, MOP, Twista, Mac 10, Consequence, Heavy D and more. Longtime fans may want to checkout both releases (the other being Final Call The Lost Tapes) as they compliment the Brooklyn MC's impressive discography and fifteen year career since first appearing with Nas on Illmatic back in 1994!